Sunway City Bhd (SunCity), developer of the Sunway Integrated Resort City in Bandar Sunway, Selangor, expects prices at its property launches to increase by 20 per cent this year compared to the levels in 2008. Its managing director of property development in Malaysia, Ho Hon Sang, said this was in line with current market trends. Ho believes that SunCity's premium pricing strategy of focusing on properties with "green initiatives" that promote quality of life will place it well ahead of competitors. "Our property prices are usually 10-20 per cent above the competitors'," he said. Bina Puri Holdings Bhd announced today the acquisition of nine ordinary shares of B$1.00 each in Bina Puri Properties (B) Sdn Bhd, a company incorporated in Brunei. This represents 90 per cent of the total issued and paid-up share capital of B$10 for cash consideration of B$9.00 (equivalent to RM20.81), Bina Puri Holdings said in a filing to Bursa Malaysia. Bina Puri Properties Sdn Bhd, an indirect wholly-owned subsidiary of Bina Puri Holdings, has also acquired one ordinary share of B$1.00 in Bina Puri Properties Brunei, representing 10 per cent of the total issued and paid-up capital of B$10 for cash consideration of B$1.00 (equivalent to RM2.31). On another matter, Bina Puri clarified that it has not received the letter of award for the third package of Malaysia Airports Holdings Bhd's new low-cost carrier terminal (LCCT) worth close to RM1 billion. "However, we are liaising with Malaysia Airports Holdings. We expect to receive the letter of award soon. We will make the necessary announcement if and when we receive the letter of award," Bina Puri said. It was clarifying a report, "RM1 billion LCCT on the cards for Bina Puri" in a news publication. Mah Sing Group Bhd's unit, Grand Prestige Development Sdn Bhd, has entered into a deal with Medan Damai Sdn Bhd to jointly develop a piece of residential land of 5.35ha in Kinrara, Selangor. Grand Prestige is given ex-clusive rights to continue with the sale and development of the land. In return, Medan Damai will be paid RM35.4 million over 12 months. Development of the land is expected to be completed in the first quarter of 2012. The land forms part of an ongoing residential project, known as Taman Damai Utama. The government needs to be mindful that for private public partnership (PPP) projects to be successful, approvals must not be delayed. Indecision and slow approvals, whether by federal or state governments, had many a time caused cost overruns in infrastructure jobs, says Master Builders Association of Malaysia. "If the government is fully committed to implement infrastructure projects sucessfully under the 10th Malaysia Plan, there has to be an element of accountability in the event of delayed approvals," said MBAM president Datuk Ng Kee Leen. "Whenever there is a delay in variation order approvals or land acquisition, the costs go up," he said. "It is not just financing costs. It's also land acquisition costs, building material costs, labour and transportation costs and opportunity costs," he told Business Times in an interview in Petaling Jaya recently. Government agencies, whether federal or state, need to execute their approvals within scheduled time limits. "If they fail to do so, they'll need to compensate the bankers who, in turn, are accountable to their account holders and shareholders," he explained. "This commitment from the government is necessary to boost investor confidence. If not, it will be very difficult for the private sector to pledge tens of billions of ringgit in loans or bond undertakings for infrastructure jobs under a PPP," he said. Another factor that can help improve implementation of PPP projects is for the enactment of the Construction Industry Payment and Adjudication (CIPA) Bill. Timely payment is vital for the survival and continuity of contractors and sub-contractors' businesses. Although payments should be made by government agencies or project owners within 30 to 60 days, which is the industry practice, it is often not the case. Currently, there is no law to mandate security of payment and quick justice via adjudication. Unpaid sub-contractors either suffer in silence or are put out of business, well before they have a chance to seek arbitration or go to court. "When there is late payment, projects are delayed, squeezing profits along the way. Chronic problems of late and non-payments affect the entire delivery chain of consultants, contractors, building material suppliers, freight forwarders and bankers. A rough calculation will show claims running up to billions of ringgit," he said. On average, construction jobs run into the millions and span over three years. With each progress payment involving big sums, Ng said the enactment of the CIPA Bill is vital to protect the interests of contractors and sub-contractors. "This law will help to minimise payment defaults via timely and cost-efficient recourse to adjudication," he said. "We have been waiting far too long for the CIPA Bill to be made law. We initiated this Bill as early as June 2003. A year later, during a construction industry roundtable chaired by the then Minister of Works Datuk Seri S. Samy Vellu, he lent support to this proposal for Cabinet deliberation," said Ng. "We, therefore, appeal to the Government to expedite the enactment of CIPA Bill," Ng said. Similar laws are already in practice in the region. Among them are Australia's Building and Construction Industry Security of Payment Act 2002, New Zealand's Construction Contracts Act 2002 and and Singapore's Building and Construction Industry Security of Payment Act 2004. PANGKOR Island Beach Resort will rejuvenate and spruce up the 26-year-old property to lure long-haul and long-staying guests. It is even looking at the possibility of building villas that will then be sold as holiday homes. The resort, owned by IGB Corp Bhd, sits on a 40.5ha site of which less than half has been developed. Recently appointed general manager Ermanno Cima Vivarelli, who termed the plan as a “360º development”, said the changes will be in infrastructure, services and activities at the hotel. “We are looking at renovating and decorating the hotel where necessary,” he said. He added that all its 230 employees, who have been working for an average of 15 years, consider their job at the resort as a lifetime project. Cima Vivarelli would like to imbibe in them the meaning and responsibilities in hospitality, so that guests know that their money was well spent at the resort. The food and beverage menu at the resort has been changed. “We have already redesigned the entire menu and wine list and at an affordable price. We are adding more fresh seafood and international selection,” he said. It is also working on creating niche packages focusing on health and wellness. Since coming on board, Cima Vivarelli, who also has vast experience in the entertainment and leisure industry, has introduced activities like fishing trips, snorkelling, island cruise, motorised and non-motorised sports like jungle bike trekking and archery. It is also offering decicated services via tie-up with tour limousine buses to ferry guests from Kuala Lumpur to Lumut, to help improve arrivals into the island resort. With all this in place, the resort is looking at garnering an a 10 per cent increase in average room rate in 2011 from RM220 in 2009. It hopes to up occupancy to 70 per cent next year from 65 per cent in 2009 and improve long stay to 10 days from five days now. In the year ended December 31 2009, it registered RM22 million in revenue and this is set to hit RM27 million in 2011. 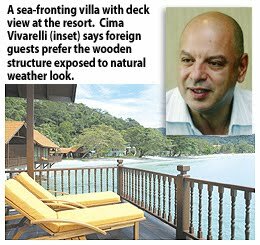 “We forecast to invest about RM5 million up to the first half of 2011 as part of our marketing and product enhancement budget,” Cima Vivarelli said. While the profile of the hotel will be maintained as a four-star property, it hopes that services and facilities provided will be in the five-star league. The resort’s guest profile is currently split equally between foreigners and locals. Locals, who include those from the expatriate market, stay an average of two nights. The hotel’s last refurbishment was six years ago, when IGB took over the hotel operation from Pan Pacific group. The hotel now has a total of 250 rooms, eight land villas and four sea villas on stilts, 80 per cent of which are sea facing and only few metres away from a 1.2km long private beach. In order promote its newly enhanced resort, the hotel has packages starting from RM398 per night for two persons which includes both breakfast and dinner for two and unlimited use of all non-motorised activities.